Every writer needs a toolkit. And I’m not talking about things like character development exercises or plot outlines or grammar shortcuts. my laptop – it’s a tiny netbook, perfect for travel. spiral notebook – Jessica Loftus covered this pretty well. I like having one in case there’s no internet connection, or no chance to use my laptop, or I just want to write something by hand. pens – lots of pens. They’re easy to lose, and easy for people to borrow and not return. You can never have too many pens, especially clicky ones (my favorite). My bag currently has four, with another two in my purse and several in my car. camera – in addition to thinking about stories while wandering around, I love to take pictures. Sometimes it’s a random object that catches my eye, or interesting landscape, like on a recent trip to northern Wisconsin. 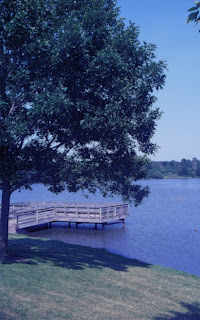 Or sometimes I decide I want a certain image for a book cover, like a wooden dock on a lake for a story I’m thinking about putting out for Kindle. random toiletries – contacts case and solution, deodorant, lotion, etc, in case I end up wanting to stay the night somewhere. It hasn’t happened yet but it might. snacks – often when I’m wandering there aren’t a lot of options for food other than overpriced gas stations, so I keep my backpack supplied with healthy stuff like homemade granola bars, almonds, and cheerios. Nalgene bottle – I hate paying for water, so I try to use my Nalgene bottle as much as I can. I’ve had it for over a decade and it’s accompanied me all over the world. Do you have any writing-related stuff you take with you everywhere? Any suggestions for what else I should put in my bag?